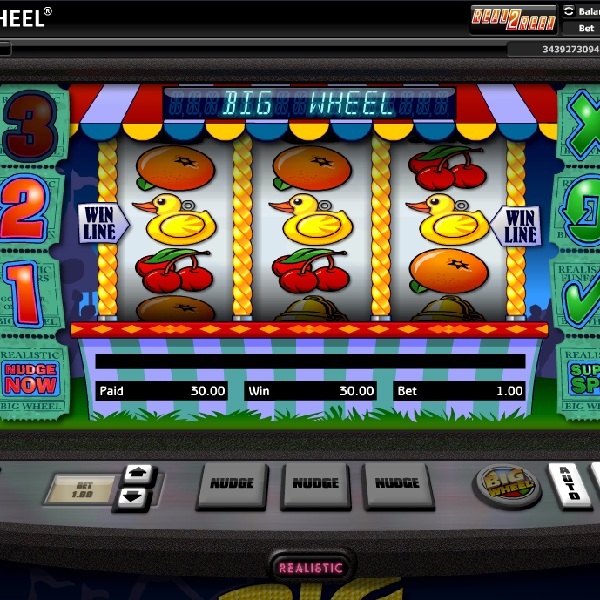 If you like old fashioned slot machines then take a look at Big Wheel slot from Realistic Games which is a classic slot with some extras. It features 3 reels and just a single payline with the actual machine set inside a casino with plenty of neon lighting. There are six main symbols which include ducks, oranges, cherries, grapes and bells. There is also a special Big Wheel icon which can appear on the third reel. When the Big Wheel symbol does land you will receive one of six different bonuses: Super Jackpot, Round About, Roller Coaster, Crazy Reels, Ring the Bell or Duck Shoot. Each one offers some large bonus payouts and some of them give you the chance to win multiple payouts. The slot also has a nudge feature which can help you to form a winning combination.